SEOUL, Jan. 23 (Yonhap) -- South Korea, Japan and Chinese Taipei will square off in a new baseball tournament later this year, the sport's officials here said Monday. The Korea Baseball Organization (KBO) said the three countries will meet in the inaugural Asia Professional Baseball Challenge from Nov. 16 to 19 at Tokyo Dome. The agreement was reached last Wednesday in a meeting held in Tokyo involving the KBO, the Nippon Professional Baseball (NPB) and the Chinese Professional Baseball League (CPBL). The KBO said it proposed the idea first in May last year. The three professional leagues had earlier played in the Asia Series, pitting their respective league champions against one another, but the event fizzled amid declining interest and lack of corporate sponsorships. The new tournament will bring together the three national teams. The KBO said the three parties saw the need to contribute to the globalization of baseball and to maintain it as an Olympic sport. Baseball had been an Olympic event until 2008 but was absent from the next two competitions. It will make its return in Tokyo in 2020. 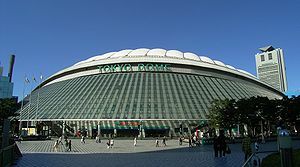 South Korea was initially set to serve as the inaugural host, but the leagues decide to hold the event in Tokyo to help increase interest in baseball ahead of the 2020 Olympics. Teams will play each other once, and the top two teams after the round-robin play will clash for the championship. The first-place team will take home 20 million yen (US$175,840), while the runner-up will receive 5 million yen. The tournament will be limited to players under 24 or to those with under three years of professional experience. The KBO said it's designed to give youngsters a chance to represent their countries. Teams can each select up to three players over the age or experience limit. The Asia Professional Baseball Challenge will be quadrennial, according to the KBO.